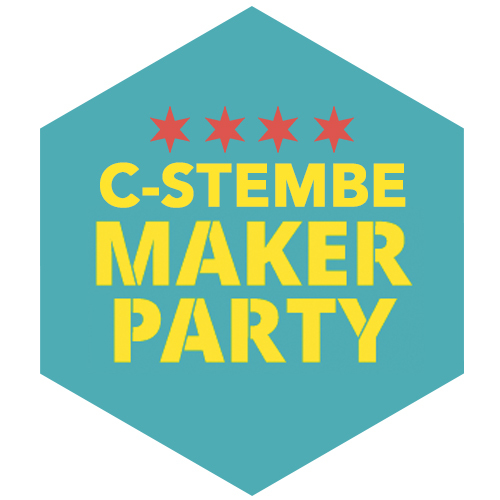 On Saturday, the Chicago Botanic Garden, Level Up, the Adler Planetarium and the Peggy Notebaert Nature Museum used an early version of our Maker Party Web App to issue C-STEMBE Maker Party badges at the absolutely amazing event Destination: Chicago. Here are some stats as of a day or so after the Maker Party. About 50 participants earned badges at the event and approximately 100 badges were issued. So far around 15 participants have registered their access codes to retrieve their badges. Badging should be easy. The Maker Party is a busy and exciting event, so the actual issuing of badges needs to be quick and easy. Badging shouldn’t require internet access. Internet access seems to always fail at the least convenient time, so we don’t want to rely on it. Badging should engage learners. 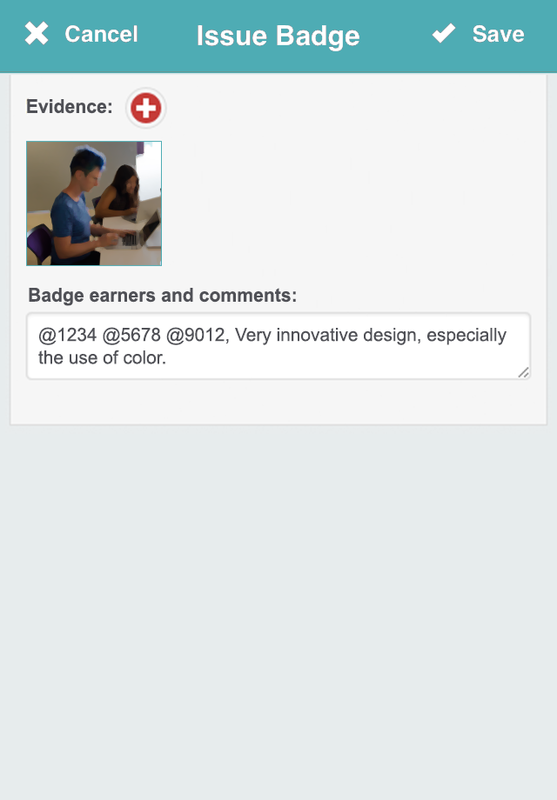 Learners should be actively involved in the badging process and not just badge recipients. Privacy should be respected. Badge issuers and earners should be able to participate without being required to provide their email address or other identifying information. Badge earners should own their badges. Earners should be able to retrieve and save their badges, including all evidence and criteria. Earners should also be able to share their badges with the Mozilla Open Backpack. Badges should highlight achievements at the event. Badges should include evidence of the learning that happens at the event, so that learners can reflect on what they accomplished and also share their achievements with others. We should learn a lot. This is an opportunity to learn about badging at an event and for us to figure out ways to improve how well our Maker Party Web App supports learners at a Maker Party. We will give out cards with unique anonymous access codes for each participant. Below is design of the cards we’re going to give out. We are keeping the cards small (the size of a business card), to make it easy to carry the card in a pocket and also to force us to keep our instructions simple. Two types of badges will be issued: Maker Party Badges and Evidence Badges. 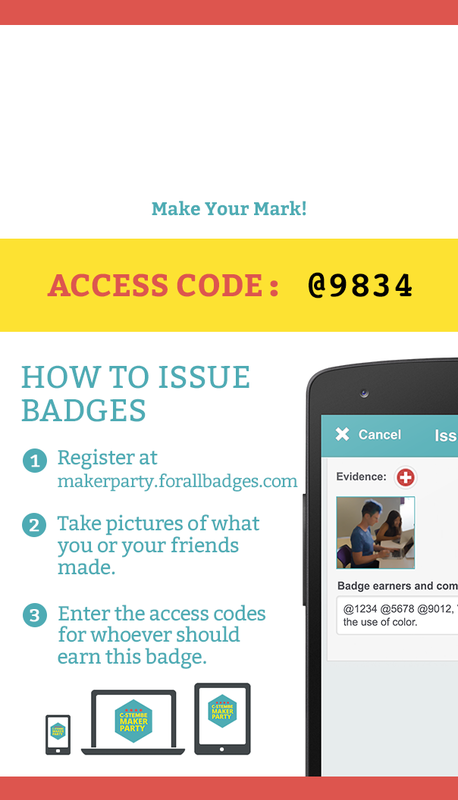 Everyone who registers their access code will receive the C-STEMBE Maker Party badge. All participants can also earn and issue evidence badges. The evidence badges will be referenced as evidence for the C-STEMBE Maker Party badge. Issue badges via a mobile web app. We are adapting the current ForAllBadges mobile web app to create the C-STEMBE Maker Party app. The images below are designs for the Maker Party app. All a participant needs to earn a badge, is a card with an access code. 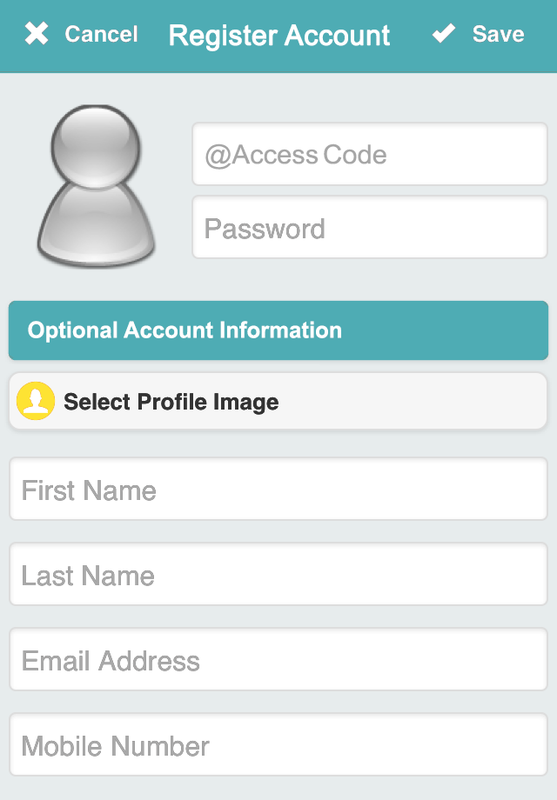 They don’t need to access the app.The first time a participant accesses the app, they will need to register their access code and set a password for their account. If they choose to register their email address or telephone number, they will receive a notification that they have earned Maker Party badges by email or sms. Participants will be able to view badges they have received and also issue badges. They can email open badges (baked with the badge meta-data) to the email address of their choosing. If they tap on an earned badge, they can view the details of the badge and push the badge to their open backpack. To issue a badge, the earners’ access codes are entered in the comments box. Participants do not need internet access to issue badges. This web app will run on pretty much any device and automatically adapts to the screen size (desktop computer, laptop computer, tablet, handheld or smart phone). The Maker Party was amazing! The experience was so much better than I could have anticipated. My 8 and 9 y.o. daughters came along and they LOVED everything. The high quality of the activities and the enthusiasm of the folks from all the various organizations was inspirational. I don’t know how the organizers from Chicago Hive and Chicago City of Learning had so much energy or managed to make everything go so smoothly. The badging was really easy if you had a smart phone with wireless access. If you were offline or on an ipad, the badging experience was still good. If you were trying to use a connection that was slow or unpredictable, things didn’t work all that well. It wasn’t practical to have learners issue badges at this event. It was nice that people who were issuing badges could also have badges issued to them. The access codes and the cards worked out really well. Everyone seemed to understand how they worked right away. Having everyone write “their mark” to identify their card was really helpful. As people came by our table, we told them, “bring cool stuff you make back here and we’ll take a picture and issue you a badge.” Kids and parents were both excited about it. The kids also seemed to appreciate the opportunity to tell us about what they made and show it to us. It seems like having a table like this is a nice addition to the Maker Party, especially since the activity tables can get really busy and also doing badging can get challenging. Right now participants can email their baked badges to themselves and upload them to the Mozilla Open Backpack. The basic idea of emailing baked badges to participants seems good, but there are still some technical details to work out in order to have this work smoothly with the current standards. Luckily there is an Open Badges Tech Panel on Wednesday about evidence. I’m going to write a separate blog post on badge baking and evidence and hopefully get more feedback then. The Maker Party was an amazing learning experience and we’re looking forward to participating in one again! We are already starting on our next blog post on Baked Badges and Evidence. We’re looking forward to the Open Badges Tech Panel in a couple of days and collaborating with others in the badging community. We have a list of improvements that we are going to make to the Maker Party App. The next version will be awesome. 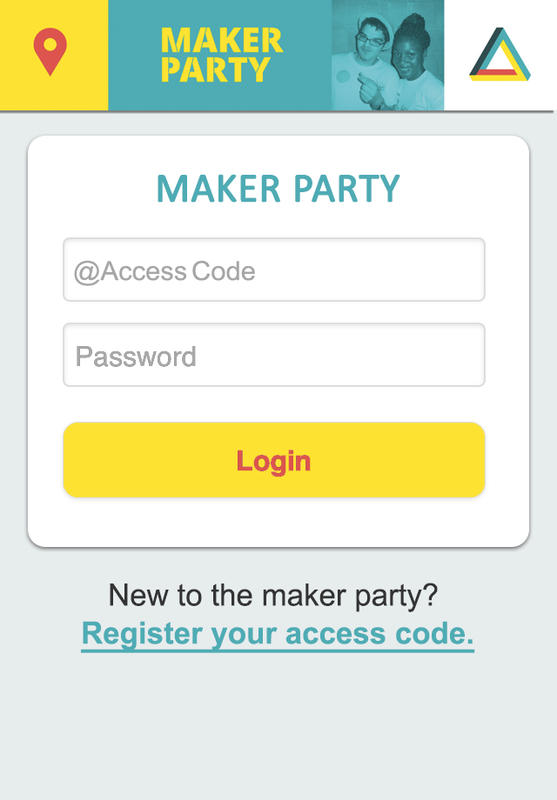 We are going to release the code to our Maker Party App as open source on GitHub. Right now the app relies on using ForAllBadges as the backend and all communication is done via a simple API. Others should be able to either tinker with our code and connect with the FAB backend or use the app with their own website. If you’ve read this far in the post, you deserve a badge! Please do share your thoughts with us. We appreciate the feedback. ← Why are Badges for School-Age Learners Different?